Atul Gawande (left) talks about the limits of "being mortal" with Divinity School Dean David Hempton at the School's annual Ingersoll Lecture and convocation. 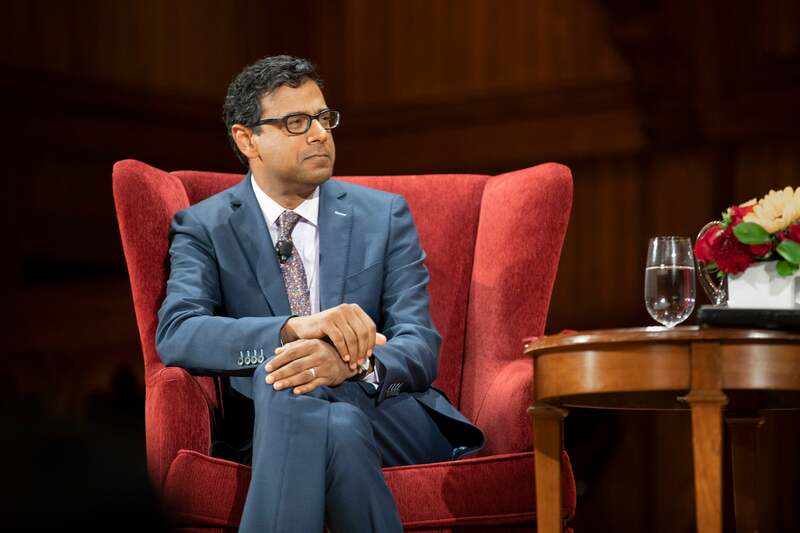 In a wide-ranging conversation Thursday at Sanders Theatre, surgeon-author Atul Gawande faced up to his own limits, including the mortality we all share. But it didn’t come easy. Hempton spoke with the Brigham and Women’s surgeon and New Yorker staff writer about his latest book, “Being Mortal,” as well as his recent decision to take on the daunting challenge of designing more efficient health care systems for employees of Amazon, JPMorgan Chase, and Berkshire Hathaway. 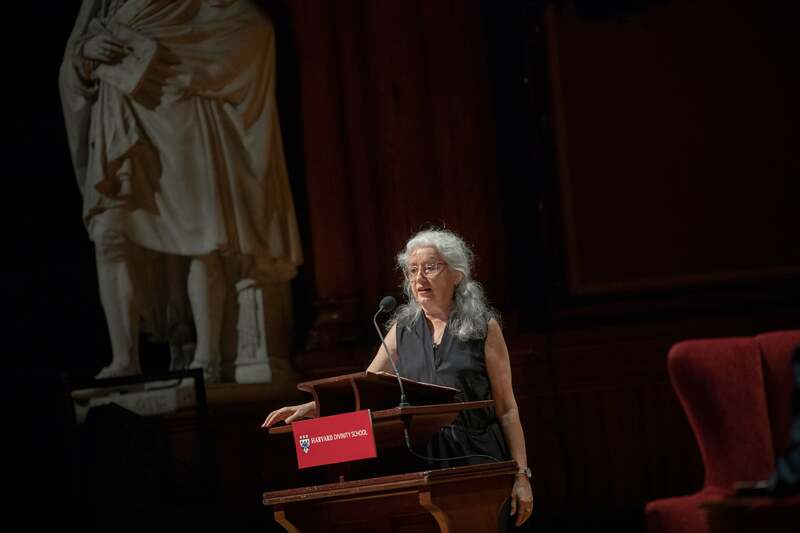 The 80-minute discussion, part of the annual Ingersoll Lecture on Immortality at the Divinity School’s convocation, extended to Gawande’s massive record collection and affinity for rock music. Asked about “Being Mortal,” Gawande noted that many people spend their final days in a desperate battle to stave off the inevitable, meaning that their last moments with family and friends are spent in a medical institution, hooked up to tubes and machines. Part of that reality stems from the assumption by many in the medical field that patients are most concerned with avoiding pain and extending life, he said. People are willing to sacrifice their health, their finances, even their lives for what’s important to them, he said, citing family, country, religion, beauty, and justice. Patients want to be at peace, often with a higher power, to have a sense of an arc to their lives, and to not be a burden to others. Some want to continue working as long as possible. Others want to enjoy simple pleasures and comforts. He told the story of one patient who said he should be kept alive as long as he was able to enjoy chocolate ice cream and watch football on television. The problem, Gawande said, is that patients and doctors are not communicating about these priorities. Such conversations are difficult and physicians aren’t well-trained in how to lead them. Instead, doctors present patients with facts about their diagnoses, potential treatment avenues, and probabilities of survival, and then tell them it is their decision. As a result, he said, patients feel abandoned and overwhelmed because the fact-based presentation doesn’t address the implications for their everyday lives. Were doctors to initiate conversations about what’s most important to patients in their final days, treatment could be tailored accordingly. “Just simply asking people: What are your priorities for your quality of life, as well as your minimum quality of life? What are you willing to sacrifice, as well as not willing to sacrifice?” Gawande said. Gawande said he realized as he wrote the book that it was not just about facing death but also about the everyday presence of mortality. Ideas about aging and death have changed dramatically in the past century, he noted. Life expectancy in the early 1900s was just 47, a reflection of the fact that health threats loomed at every stage of life. Old age was not seen as something that increased your risk of dying, as it is today, but rather as a measure of good fortune. Psychologists have shown that if you can reasonably expect to live another 20 years, you behave as if you’re immortal, Gawande said. One consequence is that most of us don’t give enough thought to what’s most precious to us. When asked what excites him the most about the future, Gawande mentioned his decision to helm a new company that will provide health care to workers at Amazon, Berkshire Hathaway, and JPMorgan Chase, with the goal of improving quality and efficiency. The effort, Gawande said, will reach many employees and seek solutions that can be scaled up to improve health care more generally. Among his ambitious goals is to make the many medical advances of recent years available to the average patient. Cognition within the brain can be blocked by an inflammatory environment (pictured) causing further damage for those with Alzheimer’s disease. Based on a mouse model, exercise has shown new nerve cells to not only to survive, but thrive.